The Three Voyages of Captain James Cook, with "The Death of Captain Cook" Plate - James Cook, John Hawkesworth, James King 1773 - Strahan, London - Second Edition, First Edition, Second Edition	A complete set of the best possible editions, superbly bound in full tree calf and with the additional ‘Death of Captain Cook’ drawn by the John Weber who witnessed the dispute and ensuing fight. 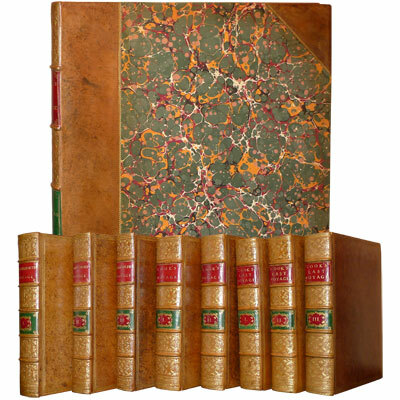 Eight quarto volumes and the elephant folio volume of plates. Magnificently illustrated with two hundred and five engraved charts and plates, many of which are double page or larger. The third voyage is in its second and best edition, with the printing by Hughs (rather than Strahan who printed the first edition) with the text itself entirely re-set. Isaac Smith presenting a set on behalf of Cook's widow in 1821 noted that 'I am desired by Mrs Cook to request your acceptance of the 4 books sent herewith being her Husbands last Voyage round the World, as a mark of her respect the letter press of the second edition being much superior to the first both in paper & letter press' (quoted by Forbes, Hawaiian National Bibliography, 85). King George III's copy of the official account, preserved in the British Library, is also an example of this second edition. This particular set with variant title pages, dated correctly, but without edition statement or vignette of Royal Society medal. On his first voyage, 25 August 1768 to 12 July 1771, Cook circumnavigated New Zealand and for the first time explored the east coast of Australia, of which he took possession for Great Britain; he also sailed through the straits separating New Guinea and Australia. On the second, and historically most important, voyage (13 July 1772 to 30 July 1775) he began by cruising as far south as possible around the edge of the antarctic ice. He again visited New Zealand and, cruising through the Pacific, discovered, or explored again, many of the islands, in particular New Caledonia, Palmerston and Norfolk Islands, Easter Island, the Marquesas, New Hebrides, Tonga, the South Sandwich Islands and South Georgia. The third voyage (11 July 1776 to 4 October 1780) was undertaken to find the North-West Passage from Europe to the East. After again visiting Tasmania, New Zealand and many Pacific Islands, Cook sailed on to North America, discovering on the way the Cook Islands and the Hawaiian group. He charted the North American coast from Oregon as far north as the Bering Strait, where ice turned him back. On the way back the great explorer was killed [in 1779] in a fight with natives in Hawaii. "Cook earned his place in history by opening up the Pacific to western civilisation and by the foundation of British Australia. The world was given for the first time an essentially complete knowledge of the Pacific Ocean and Australia, and Cook proved once and for all that there was no great southern continent, as had always been believed. He also suggested the existence of Antarctic land in the southern ice ring, a fact which was not proved until the explorations of the nineteenth century. "Cook was a brilliant navigator and hydrographer, and excellent administrator and planner, and probably the first sea captain to realise the importance of preserving the health and well-being of his crew" (Printing and the Mind of Man). These voyages of discovery were also the first to carry illustrations by professional artists (notably Parkinson, Hodges, and Webber). The volumes are justly famous for their splendid plates, many of which were engraved by Bartolozzi. The First Voyage - John Hawkesworth - An Account of the Voyages Undertaken by the Order of His Present Majesty for Making Discoveries in the Southern Hemisphere, And successively performed by Commodore Byron, Captain Wallis, Captain Carteret, And Captain Cook, In the Dolphin, the Swallow, and the Endeavour: Drawn up From the Journals which were kept by the several Commanders, And from the Papers of Joseph Banks, Esq; By John Hawkesworth, LL.D. In Three Volumes. Illustrated with Cuts, and a great Variety of Charts and Maps relative to Countries now first discovered, or hitherto but imperfectly known. - London: Printed for W. Strahan; and T. Cadell in the Strand, 1773. Second Edition. Three large quartos volumes (binding 28.4 x 23.7 cm, sheet size 27.5 x 22.4 cm) pp. [1 (title)]  [3 (dedication)]  [6 (preface to the second edition)] [6 (contents)] xxxvi [3 (Directions for Placing the Cuts and Charts)] [1 (errata)] 456 ;  xiv 410 ;  395  . Fifty-two engraved plates and charts consisting of: 9 large folding maps, 10 double page maps, 3 single page maps, 4 large folding plates, 19 double page plates, 6 single page plates, 1 large folding botanical plate. The Second Voyage - Captain James Cook - A Voyage towards the South Pole, and Round the World. Performed in His Majesty's Ships the Resolution and Adventure, in the Years 1772, 1773, 1774, and 1775. Written by James Cook, Commander of the Resolution. In which is included, Captain Furneaux's Narrative of his Proceedings in the Adventure during the Separation of the Ships. In Two Volumes. Illustrated with Maps and Charts, and a Variety of Portraits of Persons and Views of Places, drawn during the Voyage by Mr. Hodges, and engraved by the most eminent Masters. London: Printed for W. Strahan; and T. Cadell in the Strand. 1777. First edition. Two large quarto volumes (binding 27.8 x 23.2 cm, sheet size 27 x 21.6 cm) pp. xl 378 ;  [1 (title)]  [5 (contents)] [1 (notice of publication ‘Original Astronomical Observations’] 396 . Volume I page 375 bound out of sequence. Sixty-four engraved plates and charts consisting of: engraved frontispiece portrait of Captain James Cook by J. Basire after Wm. Hodges in Volume I, 4 large folding maps, 2 folding maps, 8 single page maps, 22 folding plates, 20 single page plates, 2 folding botanical plates, 2 single plage botanical plates, 1 single page plate of bird, 2 large folding scale plans of an ‘Amsterdam Canoe’ and an ‘Otehite War Canoe’. In addition there is a folding language comparison chart on page 365 of volume II. The Third Voyage - Captain James Cook, Captain James King - A Voyage to the Pacific Ocean. Undertaken by the Command of His Majesty, for Making Discoveries in the Northern Hemisphere. Performed under the Direction of Captains Cook, Clerke, and Gore, in His Majesty's Ships the Resolution and Discovery. In the Years 1776, 1777, 1778, 1779, and 1780. In Three Volumes. Vol. I. and II. written by Captain James Cook, F.R.S. Vol. III. by Captain James King, LL.D. and F.R.S. Published by Order of the Lords Commissioners of the Admiralty. - London: Printed by H. Hughs, For G. Nicol, bookseller to his Majesty, in the Strand; and T. Cadell, in the Strand. 1785. Second Edition. Three large quarto volumes (binding 26.8 x 23.8 cm, sheet size 26 x 21.8 cm) and One elephant folio atlas (binding 55.7 x 42.5 cm page size 54.8 x 41.2 cm). pp. [1 (title)]  [8 (contents)] xcvi 421  ;  [1 (title)]  [12 (contents)] 548 ;  [1 (title)]  [11 (contents)]  556 ; 65 plates. Eighty-nine engraved plates and charts in total. The three octavo volumes with twenty-four engraved plates and charts consisting of: 3 large folding maps, 4 folding maps, 11 single page maps, 6 folding plates. An additional folding ‘Comparative Table of Numerals’ opposite page 528 of volume III. The elephant folio containing sixty-five large engraved plates and charts consisting: 2 charts (1 folding, 1 double-page), 62 large plates listed in volume I, and the "Death of Captain Cook" plate which was not published originally with the set. Reference: Printing and the Mind of Man 223. Hill, Pacific Voyages, 783, 358, 361, 362. Collated and correct - 18/1/2018 (lj). Finely bound in full period tan tree calf, spines in six compartments, raised bands, intricately decorated and tooled in gilt, twin green and burgundy morocco spine labels lettered in gilt, boards with twin gilt decorative borders, edges tooled in gilt with matching tooling in blind to turn-ins, marbled endpapers, Atlas folio in matching period half tan tree calf over marbled boards. ‘Tree marbling was made popular during the early 1800s, with the earliest known tree binding dating back to 1775. The large bookbinding companies such as W.T. Morrell & Sons and Zaehnsdorf, produced tree calf bindings.